This little boy is a special one! He was a preemie baby born at 26 weeks!! He turns 14 today! I created this banner for his birthday and it is a Halloween themed one too! I used Jaded Blossom Halloween Candies! Hope you have a HAPPY HALLOWEEN and thank you for visiting!! Hi Everyone, It's Kate here with an Owl-O-Ween card for you. You can find more details my Blog. Thank you and come back again to see what Crystal has created! 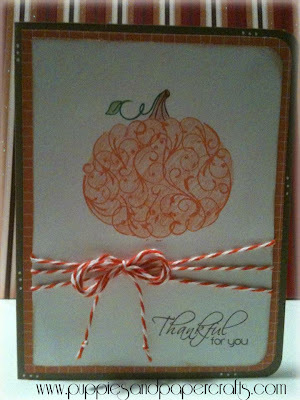 Hello, Today we have our Guest Designer Trixie of Pink Glitter Studio to share her Cute Card with us. Thank you for being our Guest Designer this Month Trixie. For my project today, I used the Mini Monsters Cricut Cartridge for the witches hat. The "Best Wishes" stamp set. Used some yummy Lime Licorice from Trendy Twine and some purple and orange glitter on the hat. I also used a cute little spider punch on the side of the card. Don't forget to stop by her blog and give her some Love. Hi there!! Kim here from Puppies and Paper Crafts! I LOVE these new sets!! I took my class to the Pumpkin Farm last week and wanted to make a cute card to let the parents know I appreciate them! 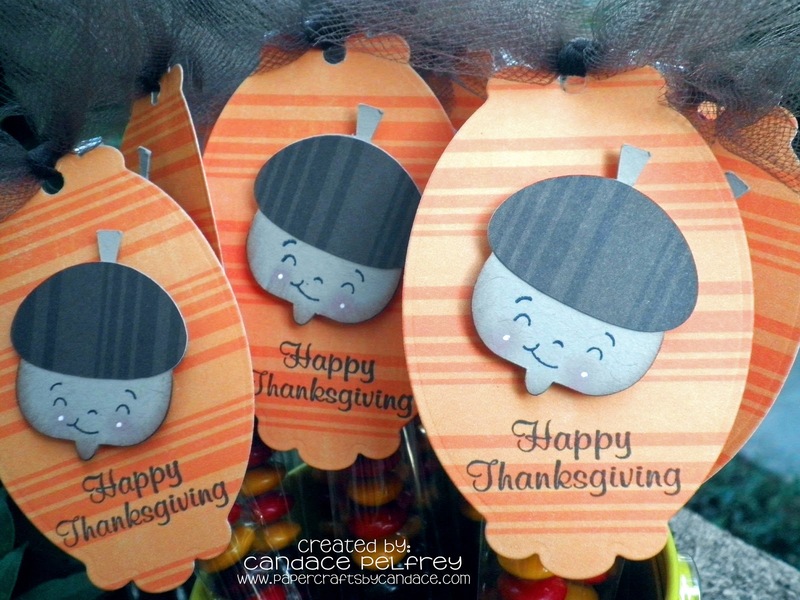 Thanksgiving Wishes Set used here! Good Morning! Abby here with a super simple treat for my daughter's pre-school class! Thank You for taking a peek!! It's Jenny from Crazy About Cricut here, and I'm so excited to share another project with you! For today's project I made a little Christmas mini album. I also made a video to show how I created the base. Enjoy! Hi Everyone! Happy Monday! Candace here.. Today I am sharing some M&M sticks that I made! 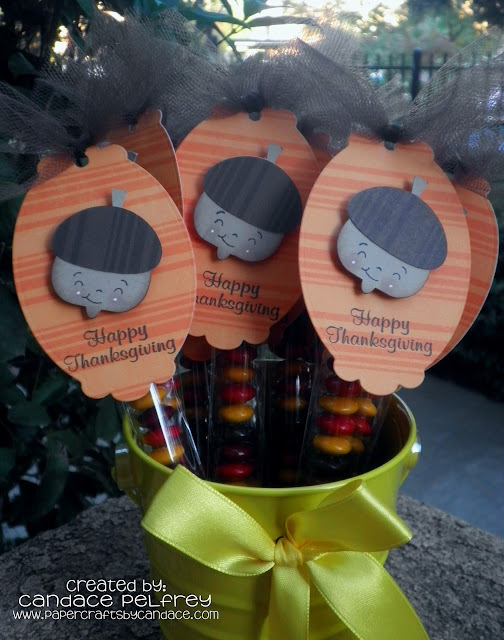 These Thanksgiving treats will be given to my family and friends on Thanksgiving. Did you see our "sneak" and exciting birthday announcement???? Click HERE to see !!!! We want to say THANK YOU for all the participates this month for our Halloween Treat challenge!! The winner this month receives the super cute stamp set "Feeling Fruity"
She made this ADORABLE candy bag with our Monster Mash stamp set! and again thank you again to everyone who participated!!! Exciting Announcement & Sneak !!! 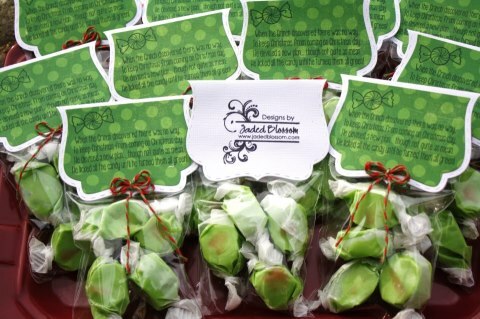 We are sooooooo excited that Jaded Blossom will turn "ONE" in December!! We are planning a SUPER celebration where we will be offering a LIMITED EDITION kit filled with several goodies !!! 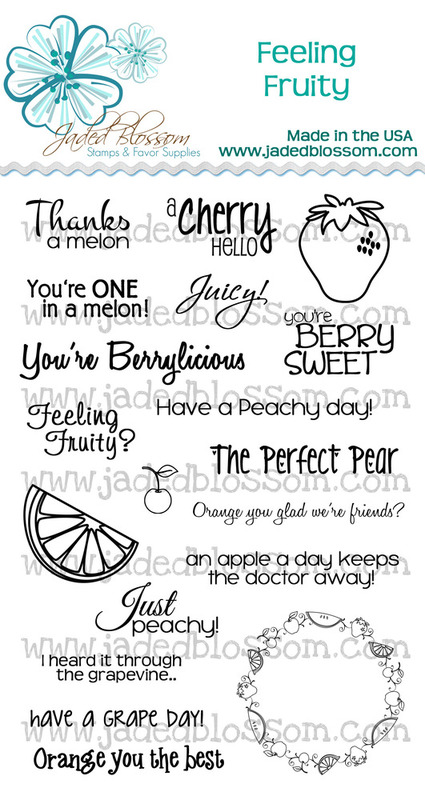 This is the BRAND new Collection from Simple Stories that will go with anything you make for a Birthday !!! So what do you think? Loving the kit so far ??? Just wait till you see whats in the birthday bag !! 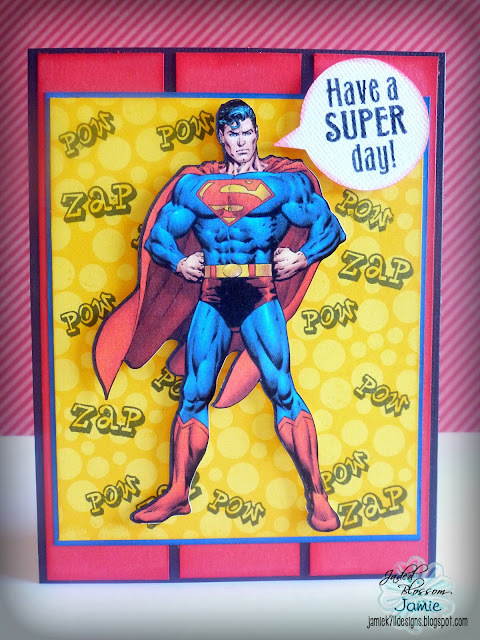 Jamie here to share a "Super" birthday card with you. I used the Super Hero set to stamp the yellow background and for the sentiment in the work bubble. Doesn't Superman look awesome popped out on this card! Don't forget there is still time to join our challenge this month! You can find the details here. Happy Wednesday Everyone! It is Crystal here from Crystal's Creative Corner! And it is my day to post for the Jaded Blossom Design Team! I just want to start out by saying THANK YOU to all the awesome Jaded Blossom Customers who made this past weekend's release a HUGE success!! 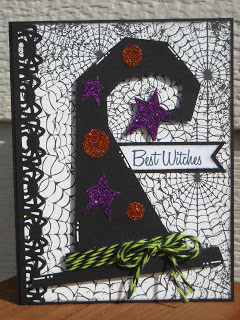 Now on to my Halloween card for today!! 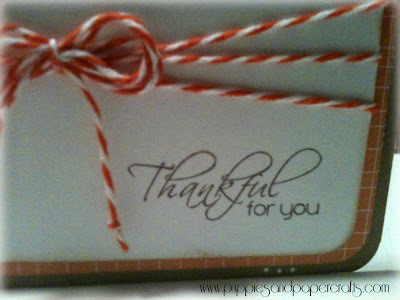 added a little 3 Girl Jam crinkle ribbon from the Harvest Bundle, and some Orangesicle Trendy Twine on the jar! I hope you enjoyed my post today! Leave a comment--I love to hear from you! 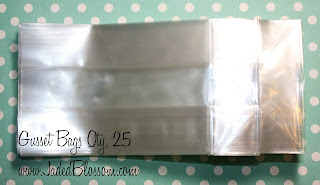 Hi Everyone, It's Kate here with a little picture tutorial for you, using our Flag Dies. I also added some twine on the Hat. I hope you like my picture tutorial. I am still a bit new at this so please bare with me. There is still time to join our October Challenge. Happy Monday!! Thank you to EVERYONE who hopped with us on Stamp Release weekend and thank you to all our customers! 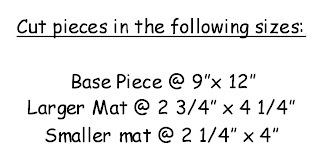 We sold out of the Fancy Topper Die, Christmas Wishes, Winter Wishes, Hot Cocoa and Santa Mail!! We hope to know more details today or tomorrow about when we will get those back in stock. We anticipate the stamps will be 7-10 days (maybe sooner) and the Fancy Topper die will be 2-3 weeks (maybe sooner). We will continue to update everyone here on the blog and on facebook. CANDACE from Scrappin' 2 Little princesses! Congrats Candace! 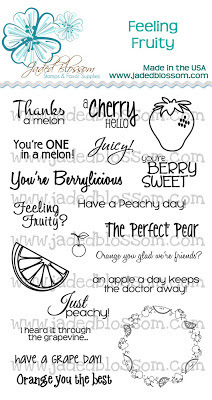 Please email us at admin@jadedblossom.com to claim your gift certificate! Thanks again to everyone who hopped and shopped! 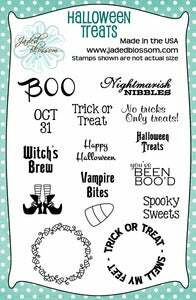 Don't forget to enter our Monthly Challenge (Halloween Treats) for your chance to win Feeling Fruity stamp set! It's is FINALLY Time! 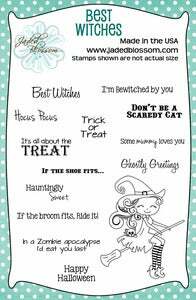 To purchase your very own Jaded Blossom October Stamp Release. Here is the link to the store, but I have also added each link for each Stamp Set and our Bundled Sets. We are almost there. Today is our Release Day so be sure to come back later at 4pm, pst. But we just wanted to show you something special. That will really make you want to sit by the computer. For Purchases of $35+ (before shipping) You will receive this Brand NEW Cancer Candies 2 for FREE and just so there is no confusion I also posted the 1st one that we had last August. The original one is Not available for Sale so you really don't want to miss this second batch because it won't be available for sale at this time and possibly ever! Now here are some inspirations from some of our DT's. Thanks so much for checking out todays Projects!! Make sure to click on the designers names to go to their blog for more details on their projects! 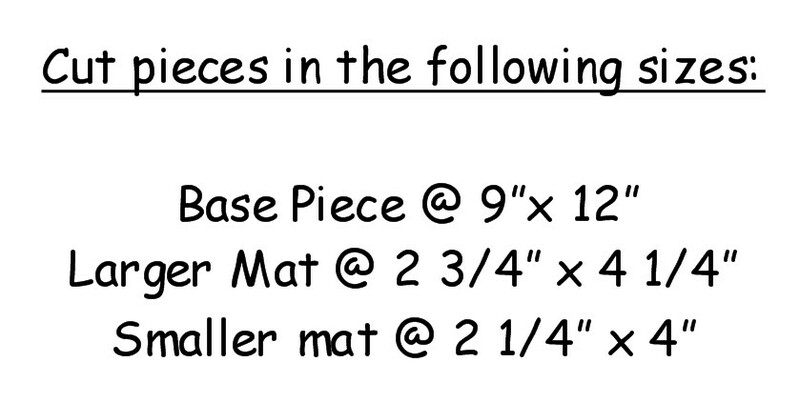 Also you know how we LOVE to create handmade goodies to send with your stamps! Here is what we created for you for this month. AND a tutorial WILL be included!! October Monthly Challenge " Halloween Treat"